As always, I will share with you a simple approach - my favorite one - using the tool Simple Transformation. The task is to import the data from an XML file, process them and finally insert them into different database tables. For demonstration purposes we will use the table named ZORDER that contains the header information like Order ID, Customer ID, or the Order Date. We will also use another table named ZORDERITEM that contains the item information like the Book ID, Quantity, or the Unit Price. Then wrap this flat structure into a table type, ZORDERITEM_TTYPE enabling you to store multiple order items as well. Then use this table type and create a deep structure, ZORDER_TYPE for importing an order and its order items. Then wrap this deep structure into a table type, ZORDER_TTYPE enabling you to store multiple orders and their order items as well. In the graphical editor, first let's insert your deep structure, ZORDER_TTYPE as a data root. 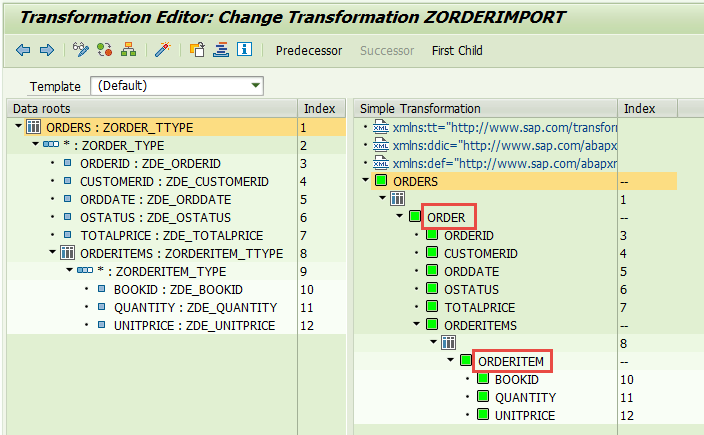 To test the Simple Transformation, let's simply create an ABAP program in SE38, ZORDERIMPORT. and inserting the the database. If you check the program in debug mode after the Simple Transformation parsed the XML content into the deep structure, this is what you see. This is the content of the header table. This is the item table of the 1st order. This is the item table of the 2st order. After running this ABAP program here you can see the inserted records in the database tables. If you know the structure of the XML you have to import, then replicate this structure in the ABAP Dictionary. Then using this structure you can generate a Simple Transformation that will map the XML tags to the ABAP fields.